Honoree/Dr. Maya Angelou speaks onstage at the The 2009 Women of the Year hosted by Glamour Magazine at Carnegie Hall on November 9, 2009 in New York City. Even for a venue as grand as New York's Carnegie Hall, there was a pretty dazzling concentration of star power at Glamour magazine's Women of the Year awards. Pop star Rihanna was there, in the most body-hugging of gowns. Tennis star Serena Williams was there, too, in a bright red, one-shoulder number. Michael Douglas and Catherine Zeta-Jones were presenters; so were Katie Couric and former President Bill Clinton. And there were not one but three Beatle wives. But the biggest ovation at Monday evening's award ceremony went to the 81-year-old poet Maya Angelou, whose soaring words on the power of womanhood brought many to tears and nearly everyone to their feet. Women, Angelou told the crowd in her speech, "are rainbows in the clouds." 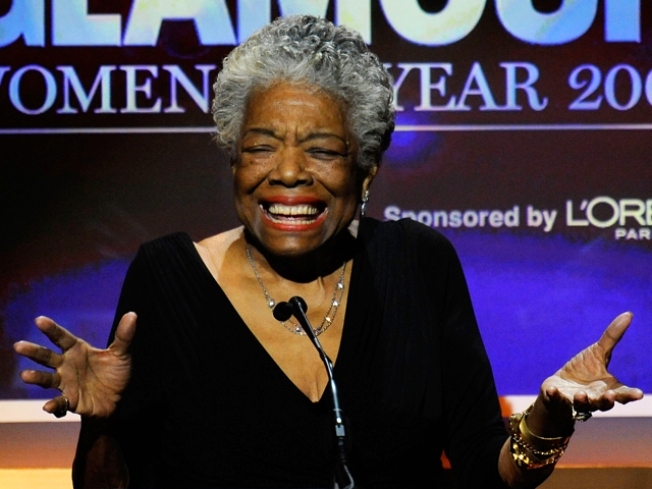 "I am grateful to be a woman," said Angelou, who won the lifetime achievement award. "I must have done something great in another life." As for the men: "You have to write your own poem," the poet said to laughter, including from Clinton, the man who had called upon her to recite poetry at his inauguration. The annual Glamour Women of the Year awards always honor a group of eclectic women, and this year was no exception. One of the evening's most emotional moments was the award to pediatrician Jane Aronson, who works to better the lives of orphans overseas and founded the Worldwide Orphans Foundation. She was in tears after Couric introduced her, even more so when surprised onstage by a group of her "kids," children from foreign countries, now adopted by American families. "You know I've never had a surprise party," she said. "Until tonight." She got a standing ovation, as did the Iranian women of the One Million Signatures Campaign, introduced by CNN anchor Christiane Amanpour. The women are working toward gender equality in Iran. Model Iman, who presented Rihanna's award, referred to the singer's ordeal early this year, when she was assaulted by boyfriend and fellow singer Chris Brown. Rihanna initially returned to Brown but said last week that she regrets it, because it sent the wrong message to her fans. Brown has pleaded guilty to felony assault. "Now I am even more impressed with her dignity and courage," Iman said, noting that Rihanna would serve as a role model to victims of domestic violence. Other honorees recently in the headlines were Laura Ling and Euna Lee, the American TV journalists who were arrested in North Korea and sentenced to 12 years hard labor after briefly crossing the border from China. They were pardoned in early August after a trip to Pyongyang by Clinton, who also mentioned the ordeal in his remarks, calling the day of their release one of the happiest of his life. Also honored was fashion designer Stella McCartney. Her dad, Paul McCartney, wasn't there, but Stella was shocked to see three Beatle wives presenting her award: Yoko Ono, widow of John Lennon; Olivia Harrison, widow of George; and Ringo Starr's wife, Barbara Starkey. Tyra Banks presented the award to tennis champion Serena Williams, who also addressed the young women in the crowd: "You can do whatever you want to do. The most important belief is self-belief." Maria Shriver was honored for her work on various women's issues, among other things. The first lady of California also produced a documentary this year on Alzheimer's disease, which afflicts her father, Sargent Shriver. And actor Michael Douglas presented the award to Susan Rice, the U.S. ambassador to the United Nations, who was also lauded via video by President Barack Obama. At a dinner later, Rice said she was inspired by many of her fellow honorees, and mentioned Aronson, the pediatrician who works with orphans, whose work she hadn't been familiar with. "We could do some real damage together," Rice said with a smile. Matt Lauer, host of NBC's "Today," presented an award to Marissa Mayer, who became the first female engineer at Google Inc. and is now the company's vice president of search products and user experience. Not knowing much about Mayer, Lauer recounted, he merely Googled her. "I discovered she had 600,000 mentions," Lauer quipped. "Not as huge as me, but no slouch." Comic actress Amy Poehler received her award from "Saturday Night Live" producer Lorne Michaels, who spoke admiringly of how Poehler performed her famous Sarah Palin rap skit when she was nine months pregnant. Poehler's advice to the young women and girls in the crowd, which included a vociferous contingent of Girl Scouts: "Girls, if boys say something that's not funny, you don't have to laugh."